I had just spent an enjoyable three days the previous week in the Southern Sierra in unusual conditions with very little snow in January. I decided to come back for more the following week, this time to visit some peaks on the west side. When I drove in on SR190 towards Camp Nelson, I had no idea that the road would be closed ahead for the winter and I would be unable to reach Johnsondale and other parts of the Southern Sierra around the Kern River. This meant that my first stop, Solo Peak, would end up being the only hike on the day due to the additional driving needed to go back out and around to reach the Kern River. Solo Peak lies on the northern boundary of the Tule River Indian Reservation, rising up between the Middle and South Forks of the Tule River, sporting almost 1,000ft of prominence. The summit itself has little to offer as it is heavily forested, without an obvious highpoint and no views to speak of. This is offset by the Black Mountain Grove of giant sequoias that grow along the route. The many trees of great size and age do not see many visitors, and then mostly by hunters during deer season. It was a fine adventure roaming cross-country across the slopes, encountering these ancient trees unexpectedly. I had driven out the night before to the Coy Flat Campground, hoping that I might be able to drive several miles further to the boundary with the indian reservation. A locked gate at the campground bars further travel along the road and so I spent the night in the van parked there. I was up and on my way at 7a under overcast skies, spending the first hour and a half hiking some four and a half miles up the Forest Service road. The road was in good condition, suitable for all vehicles. It is maintained primarily for the summer residences in the Mountain Aire development about a mile from the summit. Some guides describe the road leading over the summit into the indian reservation as a through road open to public travel. In times past this was true and is an alternative way to reach the Western Sierra Hwy south of Slate Mountain, bypassing the small communities of Quaking Aspen and Ponderosa. Though not gated, the signs clearing indicate that the public is no longer welcome on the reservation property. My route left the road at this point, generally following west along the crest to Solo Mtn about two miles from the road. I had first noticed the giant sequoias as I was hiking up the road, surprised that they were more than just a handful of trees. Their sizes were quite large and it was obvious that the area had somehow avoided the logging that took down many of the trees at the end of the nineteenth century. Where forest dominated, the cross-country was mostly straightforward and easy, but there was plenty of chaparral, primarily buckthorn, that caused my route to wander over both sides of the ridge looking for the easiest passage. Some old logging roads helped in places, but these were inconsistent and often badly overgrown. Forest Service signs are encountered all along the boundary between the reservation and the Sequoia National Forest. Some of the signs are for bearing trees, helpful back in the day before the advent of GPS. Enroute I encountered what appears to be an indian bedrock mortar. Nearby was a small US Bureau of Indian Affairs marker, likely placed to note the site should it become covered in forest duff or other debris. Of the dozens of giant trees I found along the way, only one instance was encountered of a felled sequoia, this near the summit of Solo Peak. 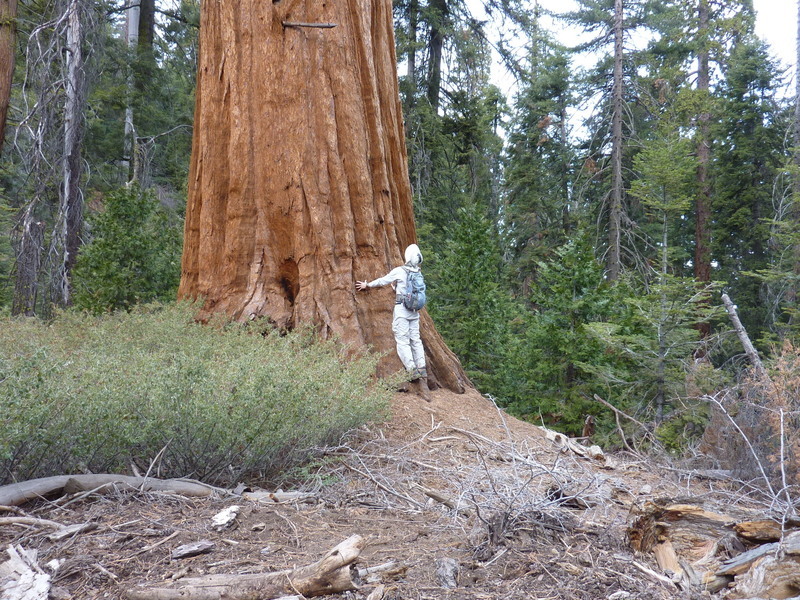 Other trees had been logged in the area in times past, but the sequoias were left intact for the most part.